I think I tend to like the idea of soup a lot more than the soup itself. I especially like making soup – it’s so fun to toss things into the pot and see how the flavors meld – but I’m not always inspired by the result. I wasn’t very excited about this soup – a “white chili” with salsa verde, chicken and white beans – but much to my surprise, it turned out fabulously tasty. The whole reason I made it in the first place was a container I found in the freezer: chopped grilled poblanos and jalapeños mixed with grilled corn taken off the cob. I had no memory of putting it in the freezer (we did a LOT of grilling last summer), but it seemed perfect for a soup. I cut up some boneless chicken thigh meat and browned it with cumin seed and slivered garlic. I added chicken stock and simmered it until the meat was cooked through, then dumped in the frozen grilled vegetables, a can of Herdez salsa verde and a can of Progresso white beans (normally I do cook my own beans, but I was feeling seriously lazy). I brought it all up to a simmer, then put it away in the fridge until evening. What a shock! 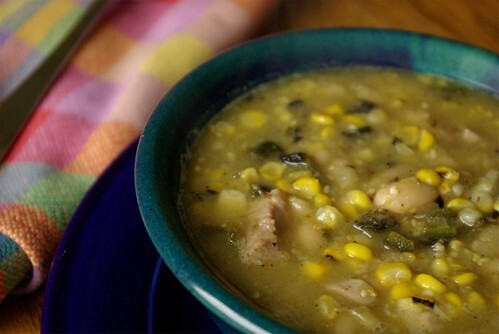 It was delicious – the corn gave it a rich sweetness that contrasted with the sharp pepper and tomatillos flavors, and the beans were plump and sweet. I finished the leftovers the next day at lunch with cheese and crackers, but a quesadilla would have been nice, too. Another soup that probably can’t be replicated, but it’s always nice when thrown together things work out this well.